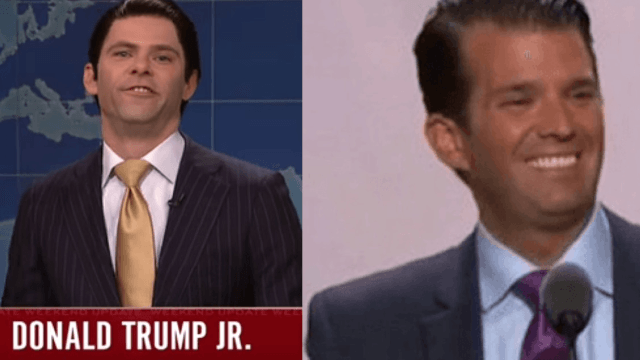 Donald Trump Jr. has a much better reaction to SNL's impression of him than his dad does. Rather than launching into a Twitter temper tantrum like Donald Trump Sr., Donald Trump Jr. has healthier coping skills when it comes to being imitated on Saturday Night Live. On last Saturday night's show, Weekend Update's Colin Jost brought on cast members playing Donald Jr. and Eric to discuss the expansive conflicts of interest between the Trump Organization and the presidency—featuring a whiny, toddler-y Eric. Unlike his dad, Donald Trump, Jr. is able to poke fun at being poked fun at, and Instagrammed a picture of himself with his own snack. Hopefully he'll reenact the Children of the Corn bit next. Wow, what a fun dude to go hunting for endangered species or compare immigrants to Skittles with.